San Diego is recognised as the birthplace of Naval aviation and is therefore an apt home for a different type of aviation museum. One of five located around the USA, the USS Midway museum is the largest and Adam Duffield takes a look for AeroResource. Opening as a museum in June 2004, the 972ft long USS Midway (CV-41) currently holds the record for longest serving ship within the US Navy operating from 1945 through to 1992. During this time it saw action as part of the Korean, Vietnam and Gulf wars as well as less aggressive roles such as the evacuation of personnel from a Philippines island following a volcanic eruption. The main entrance to the museum is via the wide open expanse of the hangar deck. Unlike many aviation museums the Midway museum is not solely dedicated to aircraft in particular and from the entrance you are initially guided towards the main ship tour. This is a self guided walk around the many compartments of the carrier giving an opportunity to see the conditions that the crew had to both live and work in and with the use the handheld audio device provides a lot of history on not only the Midway but but naval life as a whole. As can be expected, walking around the various decks of the vessel can be quite difficult with many sets of steep stairs and narrow walkways. The interior remains as it was in its final service years as much as is possible with minimal alterations in order to meet health and safety requirements. Taking visitors through sleeping quarters and engineering rooms along with flight operations and engine compartments (amongst many others) it is easy to see why carriers are often referred to as floating cities. The tour itself can take anywhere between 1.5 – 3 hours on its own but is well worth it as part of any visit. The conclusion of the tour returns you to the hangar deck where the aircraft element of the tour starts. Here, a small selection of World War II era aircraft are kept out of the San Diego bay weather along with further information on aircraft operations and history aboard the Midway. Also on this level is main museum shop and cafe both with a wide selection and a number of aircraft simulators including two seat full 360 degree versions. Following a set of stairs upwards brings you out to the flight deck with some magnificent views out over San Diego and Coronado Island. The main aircraft collection lines both sides of the flight deck with a number of volunteers on hand to talk through how deck operations work including informative talks on the catapult launch and approach systems. There are no barriers or ropes around the aircraft so movement is unrestricted and on some days certain cockpits are open to allow access. The front of the carrier provides a brilliant view over towards NAS North Island and the berths for the modern day carrier fleet that is based there and it is not uncommon for at least one carrier to always be docked. The final area available for viewing its the ‘island’ – the main control tower area that looks out over the flight deck. Unlike the rest of the carrier, this is a volunteer led tour ran in small groups of 20 due to the tight confines of the area. The queue for this can be quite long and groups are sent round at roughly 10 minute intervals. The elevated views back over the flight deck are worth queuing for alone although not much time is available to take it all in. There are over 25 complete aircraft on display within the museum along with a small number of cockpit only sections resident on the flight deck level. McDonnell Douglass F-4N 153030 – This aircraft was originally built in 1966 as an F-4B and later converted to F-4N specification in 1976. 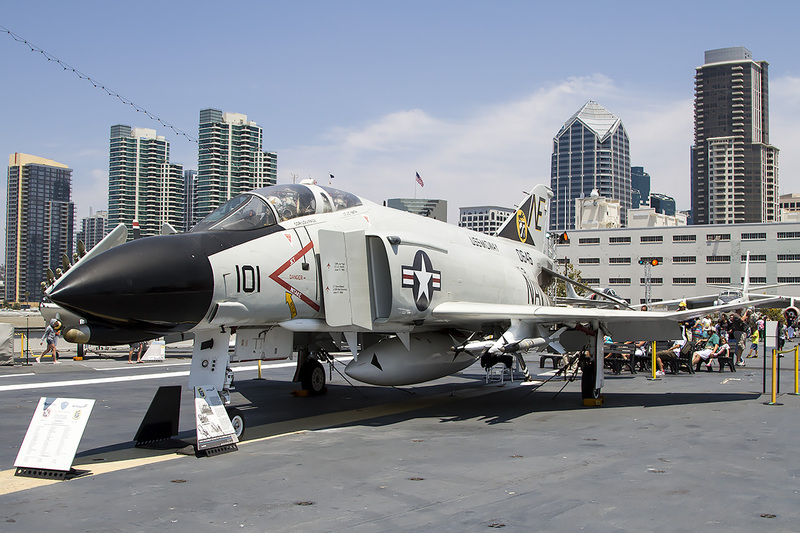 With the withdrawal of the type from service, this particular airframe made the final ever US Navy Phantom flight from Point Mugu to NAS North Island in August 2004. It now carries marking of both VF-21 (port) and VF-161 (starboard) that reflects its time based on the USS Midway. 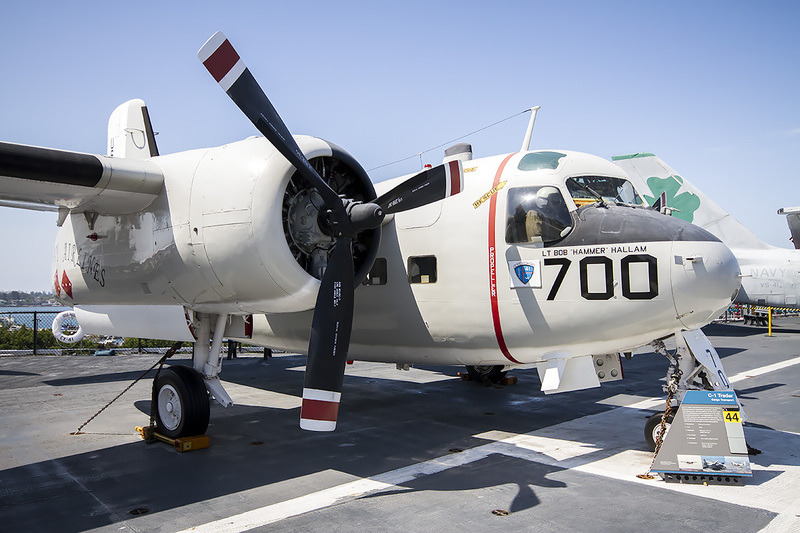 Grumman C-1A Trader 146036 – An example of a Carrier Onboard Delivery (COD) aircraft, this airframe wears authentic markings from its deployment onboard the carrier. The Midways C-1A COD detachment was known as Easy-Way Airlines and despite not being able to refuel from the carrier after its conversion to jet fuel tanks only, the type was highly successful. Cessna O-1A Bird Dog – Marked as aircraft 51-4981 it represents one of the Midways most historic moments. On 29th April 1975 the depicted aircraft landed aboard the USS Midway whilst it was in the South China Sea during the Vietnam war. Piloting the plane was South Vietnamese Air Force Major Buang-Ly who, along with his wife and five children, and as a result he became the first pilot in their airforce to land aboard a carrier. Sikorsky SH-3H Sea King (149711) – Carrying the false serial of 160172 (which is actually a UH-1N) the Sea King was used by the US Navy for Anti-Submarine warfare and this particular airframe flew from the Midway during 1971 with HC-7 Squadron DET 110. It now carries markings of HS-6 on the port side and HS-4 on the starboard with that side also representing the Squadrons role in Apollo recovery missions. Sikorsky SH-60F Oceanhawk (164079) – Originally delivered to the US Navy in November 1989 and then to the museum in November 2010, the Oceanhawk is one of the most recent aircraft to join the collection. Also an Anti-Submarine Warfare, asset it was designed to replace the SH-3 platform. 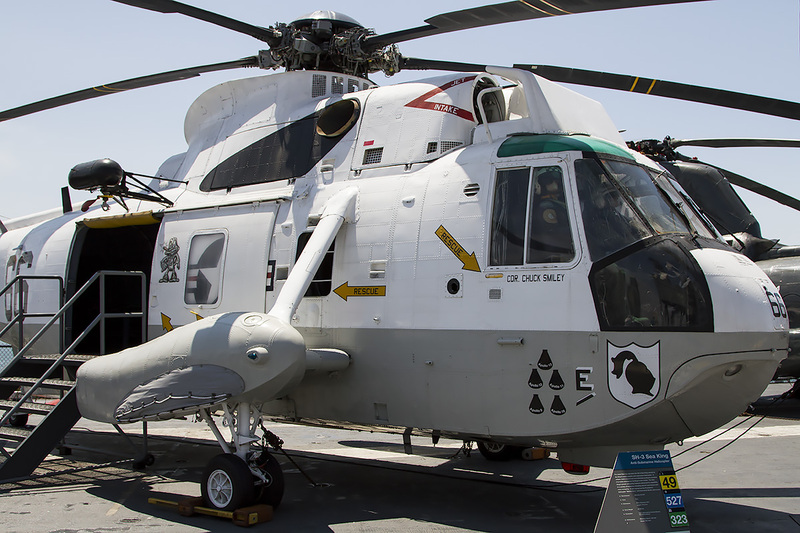 Whilst Oceanhawks are no longer based at NAS North Island many other variants of the Sikorsky S-70 family are frequently seen around San Diego such as SH-60B, MH-60S and HH-60H. Aircraft displayed range from World War 2 examples to the modern day. On the hangar deck, the earlier years are represented by aircraft such as Douglas SBD-5 Dauntless (carrying registration 54654), Grumman TBM-3 Avenger (85957), North American SNJ-5 Texan (91091) and Vought F4-U Corsair (96885). Upstairs on the flight deck, further display aircraft include the mammoth Douglas EKA-3B Skywarrior (142251) and North American RA-5C Vigilante (156641), Douglas A-4F (154977), Grumman E-2C Hawkeye (161227), the unique tilting wing Vought F-8K Crusader (147030) and McDonnell Douglas F/A-18A Hornet (162901). 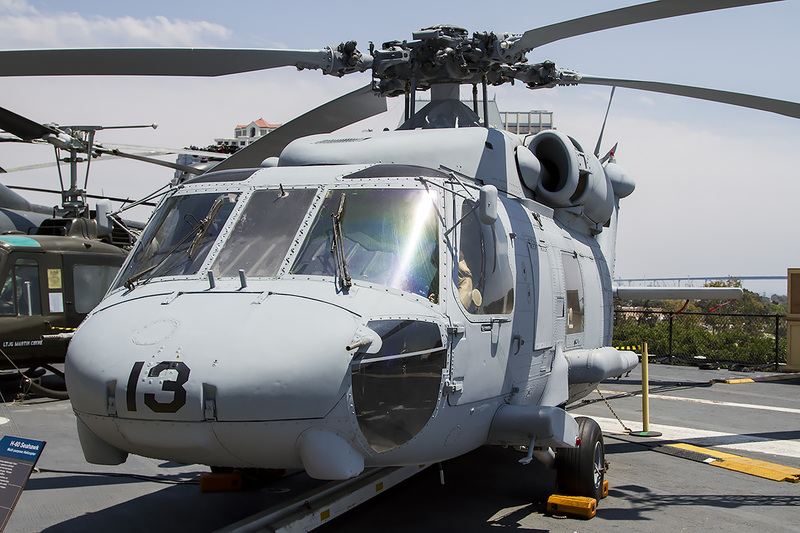 Rotary types are also well represented including Sikorsky HSS-1 Seabat (143939), Boeing HH-46 Sea Knight (150954), Kaman SH-2F Seasprite (150157) and Bell UH-1B Huey (60-3614). From an aviation perspective there are two separate areas as mentioned previously – the hangar deck and flight deck. With the hangar deck obviously being internal to the carrier there is no natural light available and the artificial light that is there isn’t very strong. Space is also tight and some of the aircraft in this area are cordoned off which, when combined with the sheer volume of visitors the museum attracts can make for difficult shooting conditions. However, the bulk of the aircraft are upstairs on the open flight deck which provides much better opportunities. The aircraft run down either side of the carrier although the position of the island means that most are positioned on the port side which, given the location of the museum, means shooting south into the sun for the majority of the day. The island tour does give some different angles over the deck however there are few areas of which to get a clean view and, as previously stated, minimal time during which to shoot. From the flight deck it is also possible to take distant shots of the carriers at NAS North Island, other passing naval vessels and the regular helicopter flights that follow the route of the bay. As one of the biggest tourist attractions in the area the Midway is almost always busy so can be very tough to find the right moment where nobody else is in the shot. Along with this it is also used throughout the year for both public and private event hire. Whilst these events are typically outside of the museum opening hours the setup can often take many hours and is carried out during opening times. During the day of the authors visit this was the case and the placement of lighting rigs and tables, especially very close to some displays, added to the difficulty of finding good angles so it is certainly recommended to check their online events guide and plan accordingly if getting the best photos is your top priority. Photography within the lower decks of the carrier that form the main tour is, as may be expected, challenging. With minimal space and lighting in many of the areas that are visited the conditions aren’t perfect and the use of a wide angle lens would be recommended. There is no doubt the the USS Midway is a very different museum to the types commonly visited and with it not only being dedicated to aviation gives plenty of variety to the visit. The collection of carrier based aircraft examples is kept in excellent condition and cover every era of naval aviation within the US forces. As one of the top attractions in the San Diego area it does get expectedly busy however this should not dissuade anyone from visiting and experiencing what is a rare opportunity to explore the inner workings of an aircraft carrier. Just make sure you leave enough time to look around as there is plenty to discover.